Every day, YouVersion has a ‘Scripture of the Day.’ Most are ‘vanilla verses’ that I might read while surfing in or out of the program for some other purpose such as making a Scripture image or conducting a little guerrilla operation behind Christendom lines… 😉 Occasionally, one of the verses will catch my eye and start a thought trail. I was raised believing this verse and Paul’s ministry in general, as well as Messiah’s work in particular was all about personal salvation. But, is that really why He came? Certainly, it is part of the mission of Yeshua/Jesus, but was that His primary ministry? Why would Paul be ashamed of telling people they could be forgiven? Or, was he attacked by the religious authorities because of something else in his message? What is ‘the Gospel,’ the good news? Christendom has long taught personal salvation and a ticket to heaven. 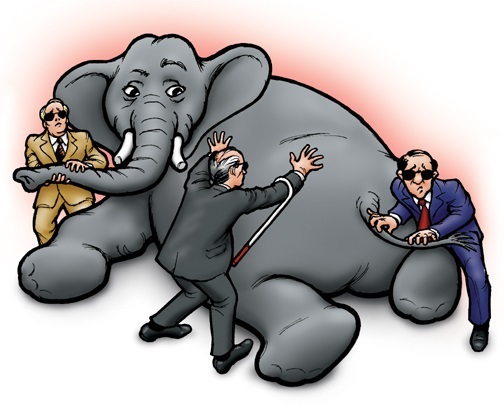 And, like blind theologians describing an elephant, they are correct with reference to the limited scope of their view. But, is there more to the picture? Are we getting all of the story of Scripture, or only a small sliver? I submit that Scripture, particularly the “old” Testament, actually speaks very little about personal salvation. What is spoken of over and over, prophesied and foretold by many prophets is the redemption and restoration of Israel…. ALL Israel. Luke 1:68-75 “Blessed be the Lord God of Israel, for he has visited and redeemed his people and has raised up a horn of salvation for us in the house of his servant David, as he spoke by the mouth of his holy prophets from of old, that we should be saved from our enemies and from the hand of all who hate us; to show the mercy promised to our fathers and to remember his holy covenant, the oath that he swore to our father Abraham, to grant us that we, being delivered from the hand of our enemies, might serve him without fear, in holiness and righteousness before him all our days. Deut. 30:1-6ff “And when all these things come upon you, the blessing and the curse, which I have set before you, and you call them to mind among all the nations where the LORD your God has driven you, and return to the LORD your God, you and your children, and obey his voice in all that I command you today, with all your heart and with all your soul, then the LORD your God will restore your fortunes and have compassion on you, and he will gather you again from all the peoples where the LORD your God has scattered you. If your outcasts are in the uttermost parts of heaven, from there the LORD your God will gather you, and from there he will take you. And the LORD your God will bring you into the land that your fathers possessed, that you may possess it. And he will make you more prosperous and numerous than your fathers. And the LORD your God will circumcise your heart and the heart of your offspring, so that you will love the LORD your God with all your heart and with all your soul, that you may live. Eze 37:21-28… Thus says the Lord GOD: Behold, I will take the people of Israel from the nations among which they have gone, and will gather them from all around, and bring them to their own land. And I will make them one nation in the land, on the mountains of Israel. And one king shall be king over them all, and they shall be no longer two nations, and no longer divided into two kingdoms. They shall not defile themselves anymore with their idols and their detestable things, or with any of their transgressions. But I will save them from all the backslidings in which they have sinned, and will cleanse them; and they shall be my people, and I will be their God. Even Paul, in his letter to the Romans explains salvation and forgiveness as well as entering covenant by faith so that (chapters 9-11) ‘all Israel’ will be restored, grafted back into the root, etc. There is no escaping the pounding drumbeat of the unified message of the prophets, apostles and even Yeshua! The resounding message is that the Messiah will sit on the throne of David in a restored Kingdom of Israel and the constitution will be the Torah! Entry into the Kingdom comes at the price of redemption for sin (breaking Torah) and learning to walk in the ways of the Father as revealed at Mt. Sinai by the Lawgiver. I believe the reason the religious authorities were so upset with Paul was because he taught that faith in Messiah resulted in being grafted into the commonwealth of Israel and being a citizen of the promised restored kingdom. Paul understood that the restoration included the scattered sheep of northern Israel. This is the message he was not ashamed of! And, that is the message I am afraid was lost on YouVersion readers just as it is lost on most of Christendom. If this is a message you have never heard, but want to dig further and see more evidence, consider watching The Lost Sheep, an excellent teaching that walks through the whole prophetic story of the restoration of Israel from Genesis to Revelation. The restoration includes the keeping of both parts of the first covenant with Israel, found in Exodus 15 and Leviticus, and in Exodus 19, the holy nation and a kingdom of priests. We are in the middle of the fulfilment of this, in the missionary movement, primarily the British Commonwealth, and the USA. Interesting timing. Israel (the Northern kingdom, and most of the Southern Kingdom) went into captivity cBC741-721, and the missionary movement between AD1780 and 1800, exactly 2520 years later. 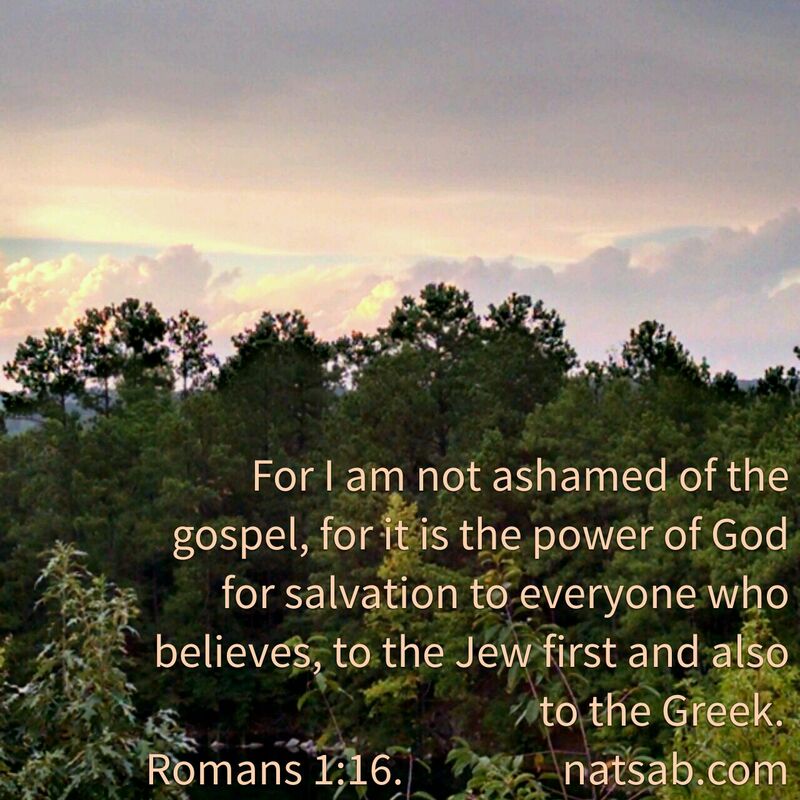 Pete Rambo (author of the blog ‘natsab’) offers us a chance to carefully consider The Gospel that Yeshua/Jesus and the apostles taught – the message of The Kingdom. Well done, Pete!